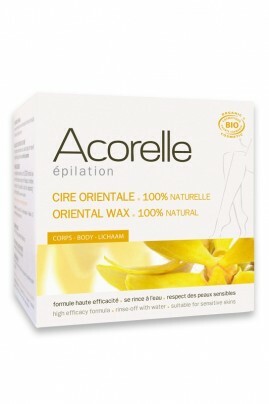 Acorelle Organic Oriental Wax Ylang Flower is the solution for a traditional hair removal and 100% mild for delicate and sensitive skin. This Organic wax contains only mild Ecocert certified ingredients to get a hair removal product wich combines natural smoothness, convenient, effective and skin friendly. Acorelle Organic Oriental Wax Ylang Flower has an efficient formula of Cane Sugar and Ylang Flower, which eliminates hairs and bulbs for 3 weeks approximately. Ylang Essential Oil soothes and relaxes your skin while Organic Camomile calms skin irritation. Acorelle Organic Oriental Wax Ylang Flower does not require heating and can be easily rinsed with water. Free from allergen, animal origin ingredient, paraben, colorant nor artificial conservative. Do not apply body lotion the day of hair removal because it will prevent wax stickiness on the skin. The day before, scrub the skin in order to eliminate dead cells, facilitate hair removal and avoid hair ingrowth under the skin. Heating : if needed to have the right consistency, heat using microwave or warming in water 10 seconds periods. A few seconds are enough to obtain a thick honey-like texture. - Put a small amount of Acorelle Organic Oriental Wax Ylang Flower on the skin. - Using the wooden spatula, glide on the wax in direction of hair growth, to obtain a very thin layer. CAUTION : you have to get a shiny patch and not a wax coat. - Put the paper strip on the wax by smoothing it firmly with the hand, then peel off quickly towards hair growth contrary direction. - Rinse off wax residues and paper strip with water (reusable 3 times minimum). Apply Acorelle SOS skincare oil to soothe skin after hair removal. Just after hair removal, avoid applying agressive products, in particular those with alcohol (like some deodorants). Avoid sun exposition and UV tanning for at least 48 hours. Moisturize the skin daily, frequently exfoliate to get rid of dead cells. Do not use razor of chemical hair remover between two hair removal because they reinforce hair bulbs and make it bigger. GLUCOSE, GLYCERIN, SUCROSE*/**, CITRIC ACID, ANTHEMIS NOBILIS FLOWER WATER*, PARFUM (FRAGRANCE). produit efficace et qui ne fait pas trop mal pourtant c'était la première fois que je m'épilais à la cire avec bandes , en revanche il faut être habitué à utiliser les bandes et la cire car hyper compliqué pour une débutante , pourtant en regardant des tonnes de vidéo tuto sur you tube .